Researchers at QuTech in Delft have succeeded in generating quantum entanglement between two quantum chips faster than the entanglement is lost. Via a novel smart entanglement protocol and careful protection of the entanglement, the scientists led by Prof. Ronald Hanson are the first in the world to deliver such a quantum link on demand. This opens the door to connect multiple quantum nodes and create the very first quantum network in the world. Their results are published in Nature. By exploiting the power of quantum entanglement, it is theoretically possible to build a quantum internet invulnerable to eavesdropping. However, the realization of such a quantum network is a real challenge—it is necessary to create entanglement reliably on demand, and maintain it long enough to pass the entangled information to the next node. So far, this has been beyond the capabilities of quantum experiments. Scientists at QuTech in Delft have are now the first to experimentally generate entanglement over a distance of two metres in a fraction of a second, on demand, and theoretically maintain this entanglement long enough to enable entanglement to a third node. "The challenge is now to be the first to create a network of multiple entangled nodes—the first version of a quantum internet," professor Hanson says. In 2015, Ronald Hanson's research group was the first to generate long-lived quantum entanglement over a long distance (1.3 kilometres), , allowing them to provide full experimental proof of quantum entanglement for the first time. 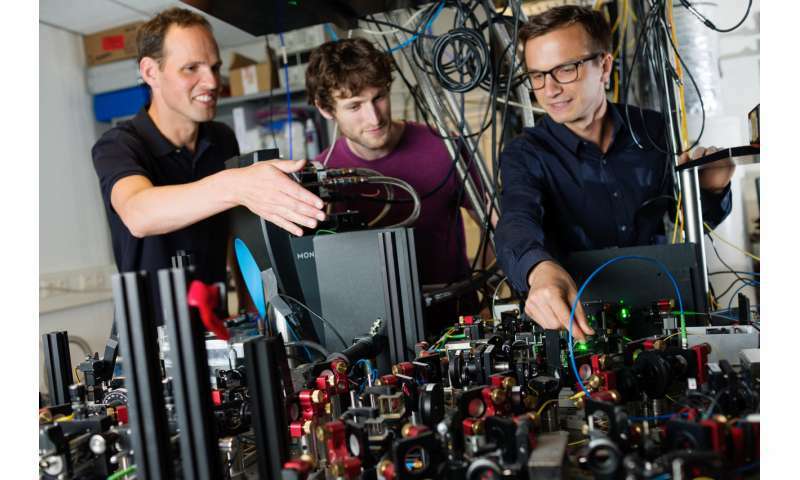 This experiment is the basis of their current approach to developing a quantum internet. Distant single electrons on diamond chips are entangled using photons as mediators. However, this experiment has not had the necessary performance to create a real quantum network. Hanson says, "In 2015, we managed to establish a connection once an hour, while the connection only remained active for a fraction of a second. It was impossible to add a third node, let alone multiple nodes, to the network." The scientists have now made multiple innovative improvements to the experiment. First of all, they demonstrated a new entanglement method. This allows for the generation of entanglement 40 times a second between electrons at a distance of two metres. Co-author Peter Humphreys says, "This is a thousand times faster than with the old method." In combination with a smart way of protecting the quantum link from external noise, the experiment has now surpassed a crucial threshold. For the first time, entanglement can be created faster than it is lost. Through technical improvements, the experimental setup is now always ready for entanglement-on-demand. Hanson says, "Just like in the current internet, we always want to be online, the system has to entangle on each request." The scientists have achieved this by adding smart quality checks. Humphreys says, "These checks only take a fraction of the total experimental time, while allowing us to ensure that our system is ready for entanglement, without any manual action." 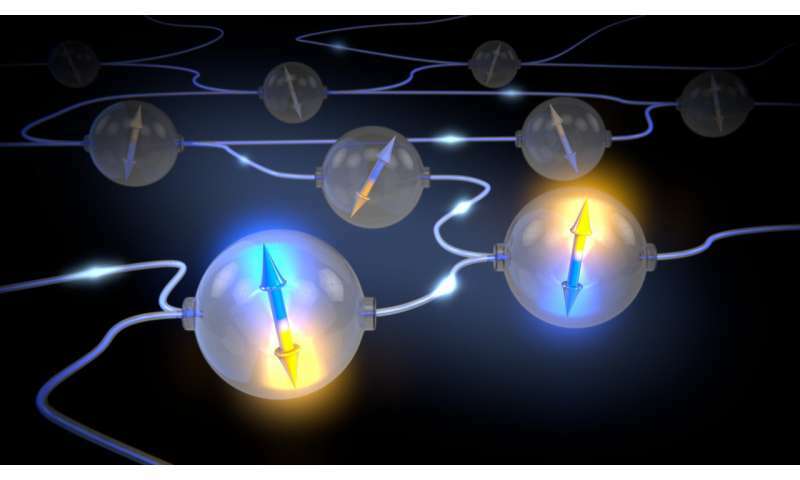 The researchers demonstrated last year that they were able to protect a quantum entangled link while a new connection was generated. By combining this and their new results, they are ready to create quantum networks with more than two nodes. The Delft scientists now plan to realize such a network between several quantum nodes. Hanson says, "Together with partners such as KPN, we want to connect four cities in the Netherlands by 2020 via quantum entanglement. This will be the very first quantum internet in the world." Hurry, The world is waiting........ You can do it ! ! This is needed. But first it needs to be verified. To my understanding this phenomenon is supposed to have the underpinnings of the Heizenberg Uncertainty Principle and other aspects that are supposed to support the overall theory of quantum mechanics. But there was an experiment done that refuted the HUP. Cashme, what you are missing is the continuing improvements of the technology to enable detection of entanglement at a distance. And not just better instruments but greater collections of data to be analyzed with more refined methodology. In science, what might have been a reasonable speculation? Attempts to produce a verifiable prediction. Which becomes an experiment. That results in ambiguous conclusions. That prompts new speculations on how to produce new experiments. And so, on it goes. As time passes, our knowledge grows ever more obsolete. Just as every college TA lecturing you in your courses would mock the failures of dead researchers. After all, in our greater wisdom, we know everything now! Another generation or two, it will be their turned to be mocked by future TA's. And yes, so it does keep going. Could this technology be leading to an instantaneous communication method to interface with other intelligent life in the universe? No, most definitely not. Classical information is still limited to C.